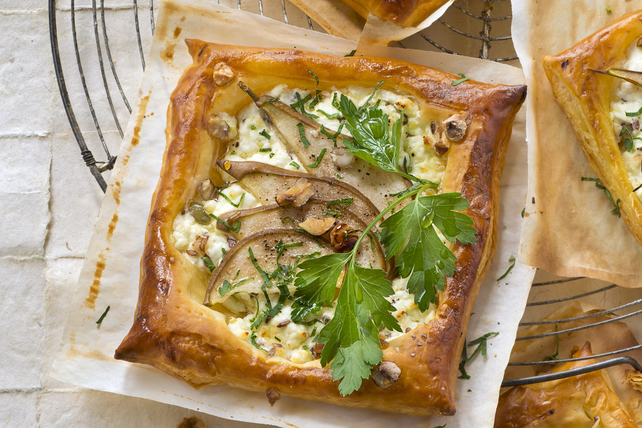 Try this Pear & Feta Tart with Walnuts recipe when you’re looking for a great-tasting starter to serve at your next brunch. The pre-rolled pastry dough makes these flavourful tarts oh so easy to make. Mix cream cheese product and feta until blended. Unroll pastry sheet on lightly floured cutting board; cut into 9 squares. Place in single layer on parchment-covered baking sheets. Use tip of sharp knife to lightly score 1/2-inch-wide border around all sides of each pastry square, being careful to not cut all the way through pastry. Prick all over centres of pastry squares with fork. Spread cream cheese mixture gently onto pastry squares up to scored lines. Arrange pear slices over cream cheese mixture; sprinkle with nuts. Brush rims of pastry squares with egg. Bake 18 to 20 min. or until golden brown. Cool on baking sheets 1 min. ; transfer to wire racks. Sprinkle with parsley; cool completely. Garnish with additional fresh parsley before serving. Prepare using both pastry sheets from 1 pkg. (450 g) frozen pre-rolled puff pastry.